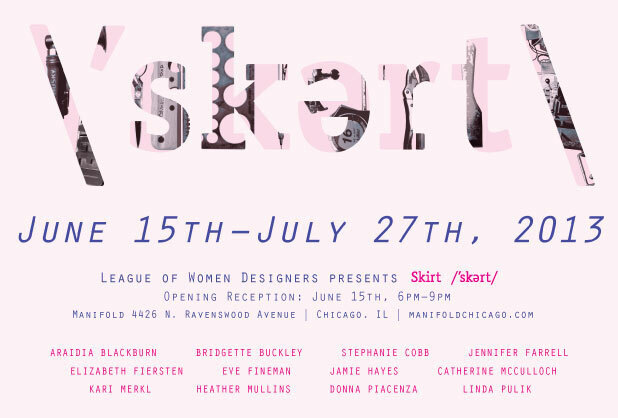 The League of Women Designers Chicago presents SKIRT, a group exhibition showcasing a cross-section of the latest work of its members from allied design fields, while highlighting various approaches to a single word, Skirt. LWD presented two panel discussions hosted by Manifold featuring leading members of the design community, programmed to cultivate pertinent and timely dialogue in association with Skirt. Skirting the Boundaries of Design - Conversations around artistic and design practices that exist at the periphery of conventional boundaries. Design & Craft / Hands-on & Digital - Discussions exploring the contemporary intersection of making, process and product.